It is amazing when a total fluke/whim sets you off on a new, awesome, path. 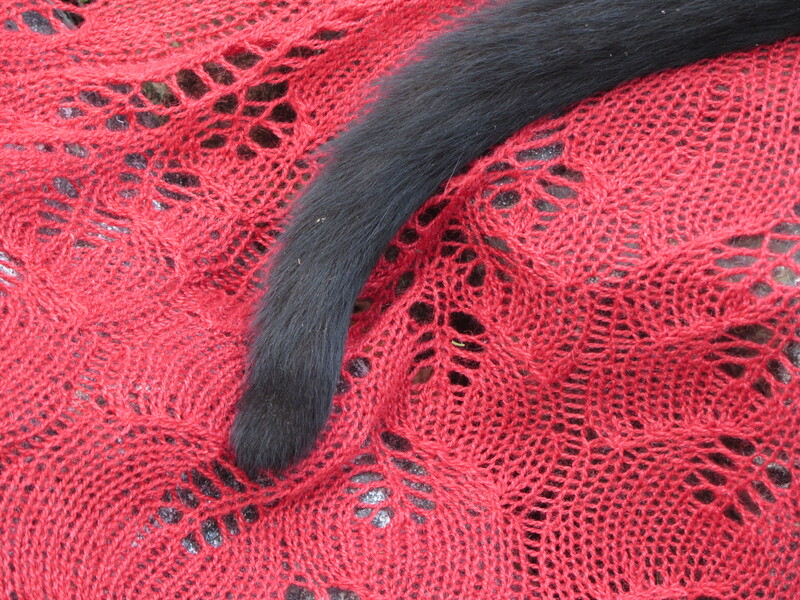 For me, deciding on May 31st to sign up for the Through the Loops Mystery KAL starting on June 1st made me realize how much I enjoy knitting lace and that semicircular shawls are amazing. It was also great that I has just the right amount of yarn, in a great color, already in my stash. So yay for stashbusting! 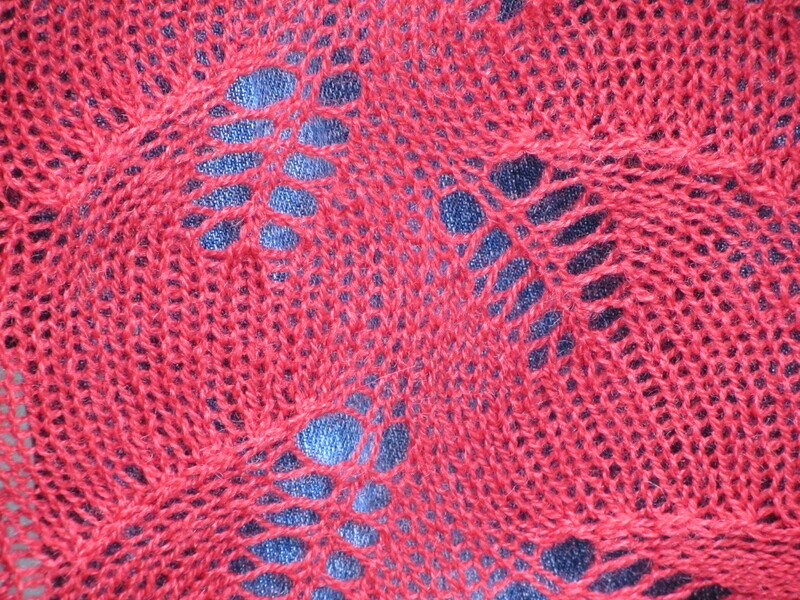 The Mystery KAL format, basically a clue every week, really helped keep me knitting on the project, I had deadlines (the next clue release) to meet and just as I was getting tired of knitting the shawl, the clue would be done and I wouldn’t have to feel guilty about putting it aside. 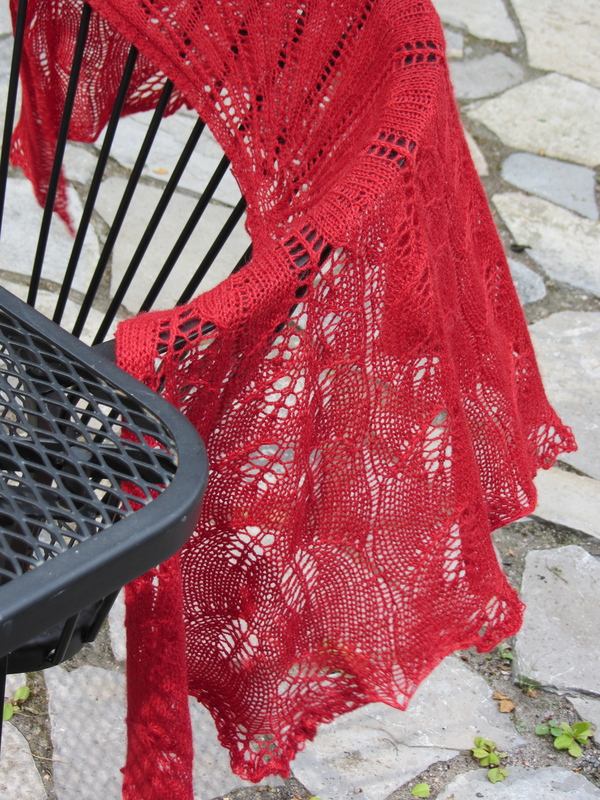 I look forward to future mystery KALs from Kristen Kapur, she seems to do a shawl and sock every year, and I think I will try to do both next year. 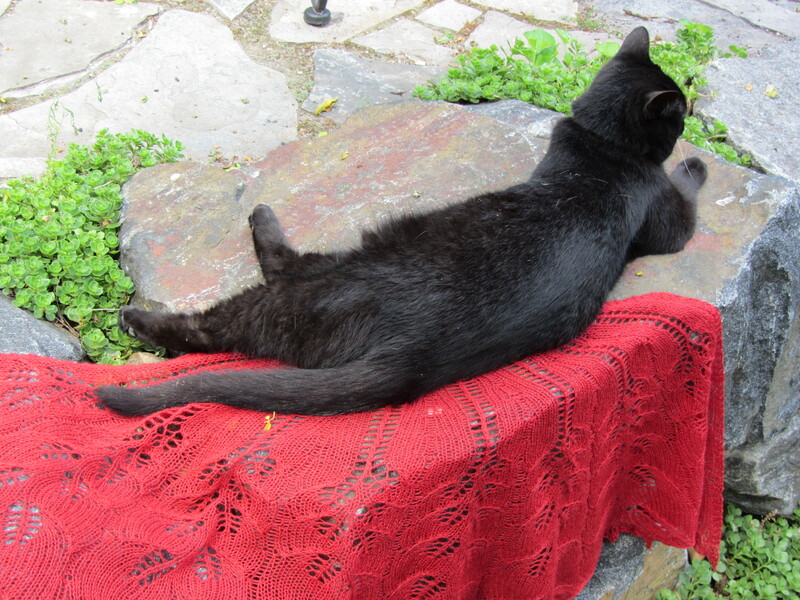 Well when you put your shawl down on Opehlia’s rock you have to expect that she will sit on your shawl. Semicircuclar Shape – This is my first time knitting a semi-circular shawl, I love it! Proper Gauge – When I used to knit shawls I didn’t understand that I am a stupidly tight knitter so all my shawls turned into shawlettes and my shawlettes in to kerchiefs, so actually work this at (slightly larger than) gauge is totally new. Yarn – It is nice, nothing shocking, but that is what you get with KP, good consistent yarns that don’t surprise (good or bad) at a good price. Kinda like Tim Hortons, good, not fancy but gets the job done on budget. 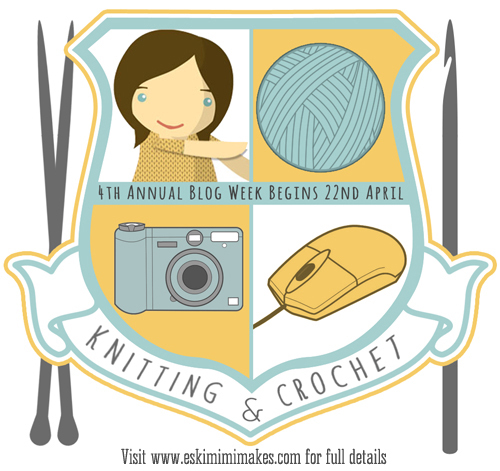 Pattern – Nice pattern, my first Mystery KAL which was fun (and helped me get it done in 4 weeks). 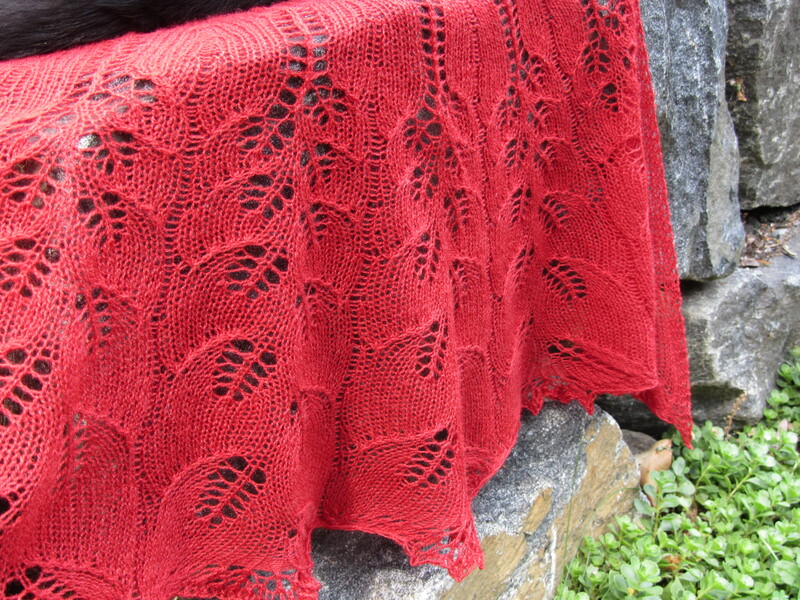 I’m impressed with Kristen’s work and I’m already planning my next shawl from her. Re-Knit? : Nope, but I’m totally into the Through the Loops patterns so I expect to make more like it in future.